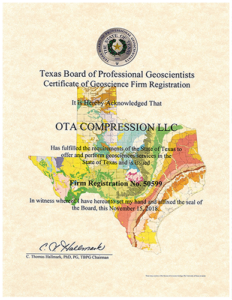 OTA Environmental’s understanding of oil and gas air quality regulations, both at the state and federal level, coupled with extensive field experience and facilities and equipment knowledge, allows us to provide you with a well-rounded air quality compliance program. Our background gives you a more cost effective and cost efficient compliance strategy. This results in more operational flexibility. 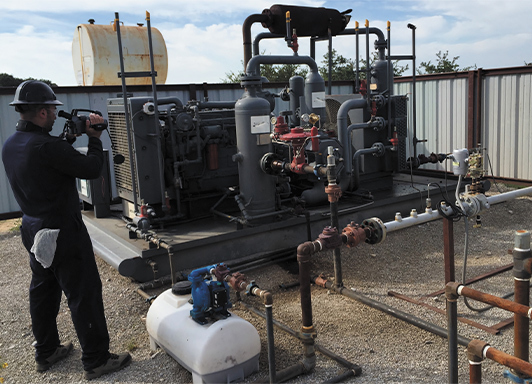 A site visit is conducted to determine applicable state and federal air regulations governing your assets. We then collaborate with you to determine if a stepped approach or a full-scale air compliance strategy is best to meet your compliance goals. When a registered air permit is not required but regulatory compliance documentation is, we complete a site specific compliance packet. This serves as proof of your site’s air quality compliance. This is an asset and can serve in response to complaints and investigations. There are instances when a registered air permit is not required to operate but federal air quality regulations (e.g. NSPS OOOO and OOOOa) require a portion of your site’s air emissions to be to federally certified. If you are uncertain if this applies to your sites, we can assist you in determining this. If your site’s emissions are required to be certified, we can assist you in maintaining compliance. We will facilitate your receipt of an air permit by completing the numerous regulatory documents and by generating an air permit application to satisfy the regulatory requirements. Once the application is submitted to the applicable regulatory agency, we serve as the technical contact to regulators on behalf of your company. After the air permit is issued we complete a review for completeness and accuracy. When required, we meet with regulators to discuss any discrepancies found on the issued air permit. When certain modifications occur at your site, they may cause you to have to modify your current air permit. We conduct a streamlined evaluation to determine if changes to your current air permit are required. If a permit amendment is required, we complete the required documentation and submit the air permit amendment application to regulators. This allows you to continue to maintain compliance by possessing a permit that accurately reflects your site’s current operations.